Ever watch the Apprentice? I enjoy waiting for Trump to pull the trigger and give it to them. ‘You’re fired!’ It’s nice to watch this from the safety of our sofas. We’re involved but also separate from it. And we can switch off. In the real world, it’s not so cosy. Sometimes you’re the one that has to give the bad news, sometimes you’re the one that has to give negative appraisals. Sometimes you’re the one that has to fire people. In many respects, this may fall under the umbrella of your Communications Plan strategy. 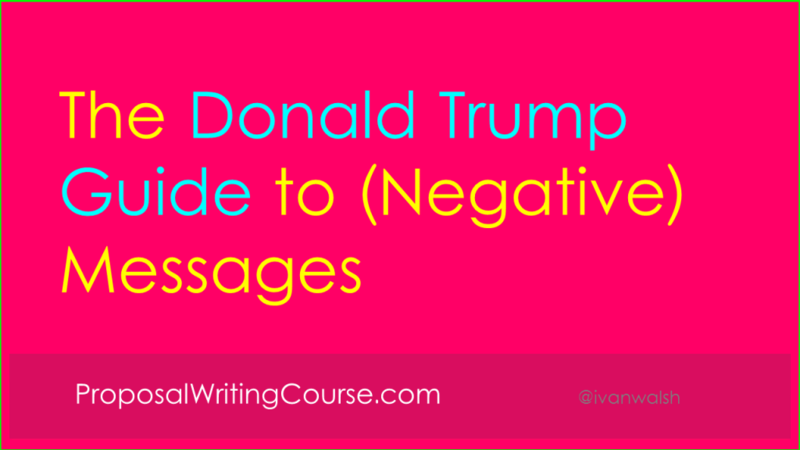 This week we look at how to write negative messages. Not nasty messages, emails and such but material with a negative edge. In some ‘negative messages’, you may have to address faults or issues with a team member. When writing these emails, reports or messages such, keep a professional tone, avoid attacking your colleague – but make your position on the issue clear. Don’t fudge it. That creates other problems. One school of writing encourages us to ‘express bad news in a positive angle’. The incredible amount of information you requested in your report is too much ad means that I cannot help you without disrupting our work schedule. Revision: I see in your letter that you require specific project information, which I will help you locate. However, due to our work load, I can answer only a few of the questions right now…. If you do not complete and return this contract by Jan 1, 2011, you will not receive your apartment. If we have not heard from you by this deadline, we will sell the apartment to another person. Please complete the enclosed contract and return it to us by Jan 1, 2011. After this date, we will have to put the apartment back on the website. I hope we hear from you before then. While I am willing to discuss changes in the Functional Requirements, I am not prepared to change the project deadlines. I am open to suggestions and comments about specific Functional Requirements, or your thoughts on additional areas that you think we should examine. However, I want to ensure that this does not impact the project deadline as you can understand. How to re-position negative communications? If you must talk about yourself (or role) in a business letter, make sure it relates to your concerns for the other person (and their role). This recipient-oriented ‘you-attitude’ writing style means the recipient is the focus of the letter, not you. Like Donald Trump you will have to deliver bad news on occasion. The approach you use, and how you structure your arguments, will influence the outcome. Instead of creating conflict, you can help the Project Manager or Proposal Team Lead to see your side and try to accommodate your needs. The trick is to acknowledge their needs first and then outline where you stand in relation to these. Don’t bulldoze them into submission. You may win the first battle, but you’ll lose the war. What’s the worse piece of news you have to give someone in the office?